Best Yoga Apps: Yoga is one of the most popular forms of exercise in the world that not only helps us to stay healthy but also act as a very good way of de-stressing. Yoga has been around from a really long time and is known to offer multiple health benefits like reducing body weight effectively, increase stamina, reduce the chances of heart diseases and also relieve stress. If you are someone who wants to stay healthy always and also want to keep your stress level down so that you can relax well after a hard day’s work, you can start practicing yoga from today itself. 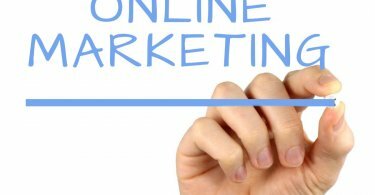 Now, if you are thinking that you will need to shell out a lot of money to get a professional instructor to help you out with the process, then you are wrong my friend! This is because there are a number of great applications available now which you can download on your smartphone to help you get started without burning a hole in your pocket. Take a look at some of the best yoga apps that we have compiled below just for you. By using these best yoga apps you will be able to enjoy a yoga session right at your home. These apps provide in-depth details about the various poses and how to perform them safely. 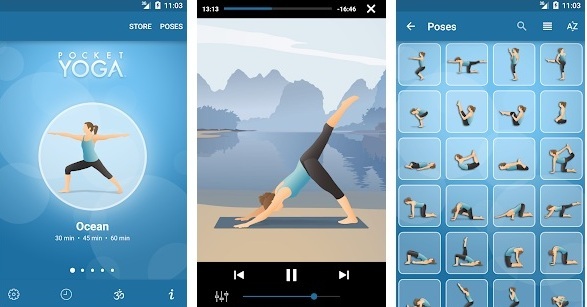 Some of these apps also feature background music to make your yoga session more engaging. Yoga Studio is one of the best yoga apps for iPhone that brings a virtual studio right at your home. The app provides more than 80 yoga and meditation programs of various lengths, intensities, and purposes for you to choose from. The app allows you to create your own video classes in HD quality with customizable background music. The app also boasts an instructional library with in-depth details about more than 280 poses. It is available for free on the Apple App store. 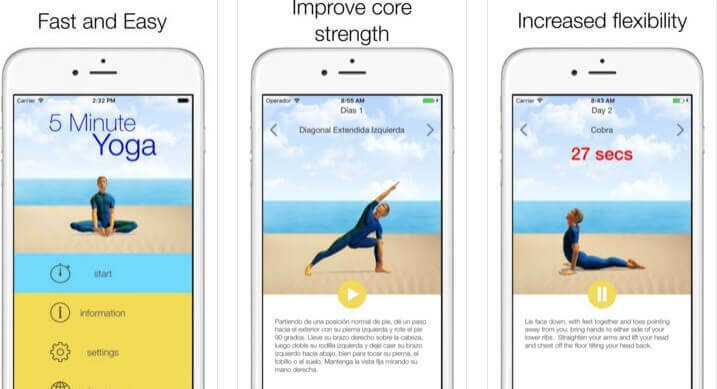 Down Dog is another very popular yoga app that is available for both Android and iOS users. The best part about this app is that it allows you to customize the session lengths, workout types and more. The app also provides vocal instructions with different background music in each session. Some of the other features include Google Fit support, offline support, and beginner level classes. This app is available for free however you can subscribe to its pro version at $7.99 per month or $49.99 per year to enjoy more features. 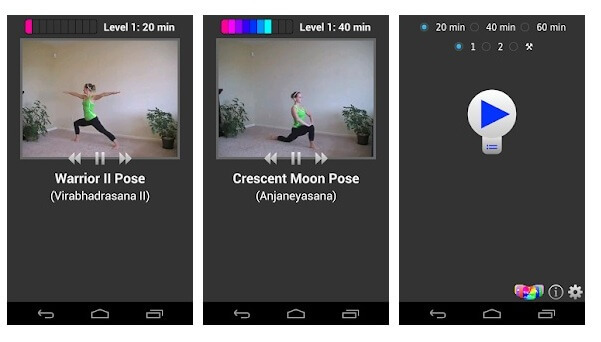 Daily Yoga is by far the best yoga app for Android. The app provides more than 500 asanas and 200+ yogas which have been explained comprehensively. It allows you to choose your workout according to the level of difficulty and also provides soothing background music in each session. The app is available on the Google Play and provides the first five sessions free of cost after which you have to pay a nominal subscription fee. If you want to try out yoga for the very first time then 5 Minute Yoga is the app for you. This yoga app for beginners boasts a large collection of simple and effective with detail instructions about the each one supported by images. It also features a timer which ensures that you do not waste much time trying out a new pose and complete the whole session within a stipulated time frame. The next application on our list of the best yoga apps is called Pocket Yoga. Doing justice to its name, the app is one which will allow you to practice no matter where you are as long as you have your smartphone with you. It features more than 200 poses with images and detailed audio instructions to carry them out. 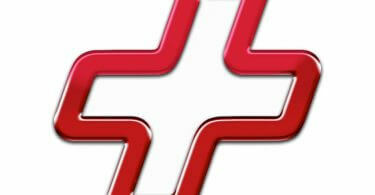 The app also allows you to preview your practices with your own customized background music. Another great feature of the app is the compatibility with Apple TV that lets you stream sessions directly. Simply Yoga is one great app you can use to start off your yoga regimen at home. It features a series of videos in durations of 20, 30 and 60 minutes to guide you through 30 available poses. The app comes in a free as well as pro version with added features. While the free version features beginner level workouts and asanas, the pro version provides access to higher levels of workouts. Once you have learned the basic yoga poses, you can opt for the pro version to try out the advanced levels. As mentioned earlier, yoga is one of the best forms of exercise to get a fit body and a relaxed mind at the same time. If you also wish to start practicing yoga to get a healthy lifestyle, try out any of the best yoga apps 2018 that we have mentioned above as per your liking. We would also like to tell you that you should start off with the beginner level workouts first and proceed slowly to the advanced ones to avoid stressing your body too much.